IPOH is famed for many things. Flat rice noodles, Tan Sri Michelle Yeoh, verdant limestone mastiffs, and its rich mining past, among other things. It was also known as Mercedes-Benz territory because between the 1950s and late 1990s a two-storey high illuminated sign of a three-pointed star in Gunung Rapat lit up in blue at night, welcoming all who came to Ipoh. Looking at the property market, head of business development for Oriental Realty Gladwin Agilan, said in an interview last year, Ipoh began showing signs as a potential property hot spot in 2008 when pre-war properties in Jalan Raja Ekram, Jalan Lau Ek Ching and Lorong Panglima were converted into watering holes and eateries. Enormous amounts of persuasion were needed to convince the owners of the historic buildings to sell, Agilan said. “They really have a lot of holding power. There are cases where offers have had to wait between six months to a year before getting a reply. The oft-received response I always get from the owners is ‘Not now’. Understandably so, as some of the buildings are ancestral homes,” he said. Over 10 years, just in the pre-war-building segment alone, prices have appreciated from as low as RM150,000 to as high as RM600,000. “In our records, the last transaction for a pre-war building was at RM950,000. Currently, offers have reached RM1.1mil,” said Agilan. The positive ripples of change can largely be attributed to infrastructure development in Ipoh, said experts during a forum organised by StarProperty in Menara Star recently. Managing director of Andaman Property Management Sdn Bhd and forum moderator, Datuk Seri Dr Vincent Tiew, elaborated on some of the factors bringing about its revival. Tan said the upgrading of the Ipoh airport and carriers like MAS, Firefly and Malindo Air servicing routes to and from Ipoh to Johor Baru, Singapore and Indonesia, is one. There is also the double tracking and electrification of the KTMB train line connecting Ipoh to Padang Besar, Perlis, and the proposal of the 316km West Coast Expressway connecting Banting to Taiping. For an idea how these networks have contributed to visitor influx, Tourism Malaysia Perak director Ibrahim Seddiqi Talib said that the electric train service alone, which connects KL Sentral to Ipoh five times daily, saw some 1.7 million passengers being brought in from January to November this year. Adding icing the cake is a RM400mil joint venture between Perak Corporation Bhd and Sanderson Group International Pty Ltd, an Australian company with 25 years of experience in building theme parks, to build a theme park in Bandar Meru Raya, Ipoh. According to Animation Theme Park Sdn Bhd chief executive officer Darren McLean, one of the speakers at the forum, a projected total of 1.4 million international and domestic visitors a year are expected once one of Asia’s first animation theme parks is opened before Christmas in 2016. The 50 acre entertainment facility, adjacent to the Jelapang toll, will be located about 15km from Ipoh. Its existence will add to Perak’s other two theme park attractions — Lost World in Tambun and Bukit Merah Resort in Taiping. “Andaman entered Perak to develop its first project three years ago, when I heard the state was close to concluding the deal with Sanderson,” reveals Tiew, a Klang native whose company has interests in over 200 freehold commercial shop and office lots in Bandar Meru Raya, near the location of the park. Looking at Ipoh’s offering of choice locations, the gravitational trend is towards some of its most famous landmarks, like the Sultan Abdul Aziz Recreation Park or Polo Ground. Industry observers say never mind that it’s just beside a Chinese cemetery, if the land mark is old enough, it’s good as a marketing magnet. 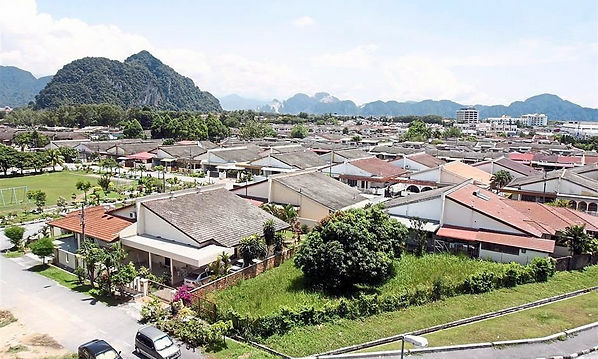 Chances are, if a development is just within walking distance of the Ipoh Royal Golf Club, Perak Turf Club, any of the pre-war coffee shops down town, or even the 100-year-old St Andrew’s Presbyterian Church on Jalan Tun Dr Ismail, it’s considered a choice buy. The general area is known to locals as Tiger Lane, famed as the address for housing much of Ipoh’s old money. Not surprisingly, Andaman is polishing its portfolio with Upper East, a five block apartment in this location. The development’s website promises that coming home will be akin to checking in to a five star hotel. The project’s landscape design director Mark Mahen has revealed the landscape facilities alone will cost the developer RM5mil. For marketing appeal, Tiew has described a strategy which aims to bring the cream of Mont Kiara’s top condominiums in Kuala Lumpur to Ipoh but at lower prices. These units will be sold at 15% to 20% lower than the current Tiger Lane property values. Metaphysical factor also play a part in sparking new developments in Ipoh said president of the Malaysian Institute of Geomancy Sciences Professor Joe Choo. He the power of the majestic limestone hills surrounding the residents of the city. “The most ideal location for a property in feng shui terms is to have the back of the house to a mountain and its entrance facing a river,” advises Choo. It matters of course, if the property is located at the concave or convex part of a waterway. “In feng shui, the concave part of a river is likened to a comforting arm which acts to nurture. Therefore, it is typical to find these areas prospering over time,” says Choo.